For power, since the Cyclone uses such a low voltage that finding a suitable 300 series motor to operate the swarmy at 400-500RPM from its battery pack would be difficult, I opted for a separate battery setup, consisting of two small 9 cell packs of 700mAh 2/3AA NiMH cells mounted in a custom stock and attached to a series harness to give 21.6V nominal. This yields 500-550RPM (my ideal full auto cyclic rate) from the Swarmfire with stock 360 motor and new style Nitefinder spring. Initially there were some problems with flexibility in the Stryfe barrel nut's mounting causing the extension to be looser than desired. These were solved by Devconning the trunnion/shroud/lower rail assembly, of which the barrel mount is part of, permanently into the receiver. 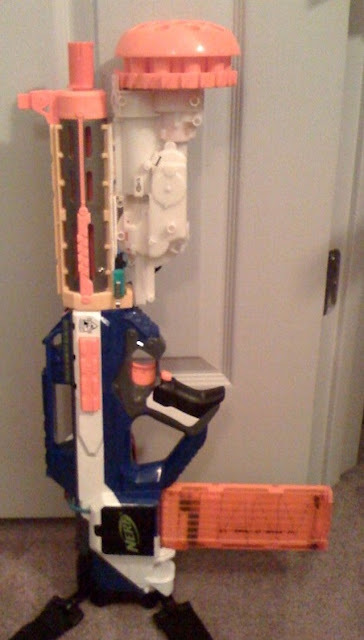 Removing the Cyclone's flywheel cage requires separating its halves and removing the internal barrel segment of the Stryfe before the motor mount side of the cage can lift out. If you know me, you know I am a fan of M203-style triggers for underslung things - in which you use the mag as a pistol grip. 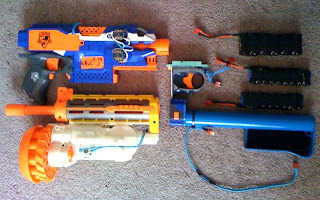 I simply did what I have done for Swarmpedes and made a shortened Swarmfire shell derived trigger pack for this. 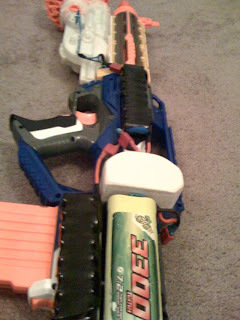 This was eventually mounted to a very sturdy rail grabber fabricated from PVC sheet, and installed on the Stryfe's chin rail. You can see one of the Deans connectors used for disassembly of the wiring. 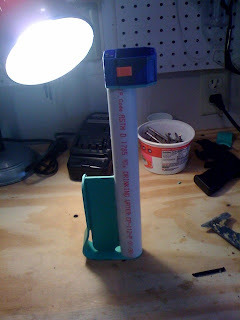 A goal of the project was to avoid modifying the base gun at all costs and preserve the ability to remove the barrel extension and stock from the receiver without tools. While I eventually came to find that the compromises I made to do that were not really worth the benefit when looking purely at this one rifle, the "swarm module" ended up by pure dumb luck with the Swarmfire's receiver not overhanging the locking collar at all. Thus, the result was unintentionally compatible with most anything that accepts N-Strike barrel extensions. By the way, that is called a Hurricane. It's a cycloned Rayven. Currently it's not a good shooter. Something is off and it doesn't want to hit full velocity (probably a flywheel cage alignment gremlin), and I need another set of T20A flywheels for it. This is a prototype. Remember? The microswitch is the trigger for the swarmfire! 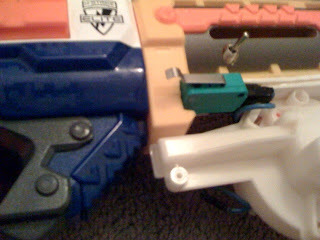 The toggle switch currently disables the integrated trigger, allowing use of the external trigger pack. However, accidentally flipping it is equivalent to holding the trigger down continuously when the MASS is used withOUT the external trigger pack. That will be addressed later with another switch requiring deliberate effort or tools to operate, and the toggle will be used for safety. The trigger will be guarded, but as much as I hate the bare microswitch, it works too well and is probably going to always be a feature, at least of the MASS-1. Hopefully I can do it less ghetto in MASS-2. How I handled the battery situation. Once again, two 9 cell 700 packs - this time, simply velcroed to the Rayven receiver where convenient. Is it pretty? No, but it works! It's not unbalanced. Not at all. This is a very wieldy setup. The 700 packs are really nice. They don't have the punch of big sub-C cells or a lipo, but they do well enough. The equivalent 14500 jerry rig for this application is 6 cells, and these packs are probably less bulk and weight than six 14500 and the holders... and of course they absolutely stomp the 14500 into the ground when it comes to usable capacity and discharge rate! Anyway... I am liking the modularity of this system. With the trigger onboard, it can be installed on anything that can mount standard extensions and provide an instant force multiplier and backup. So there you go, MASS-1 installed on the Hurricane. DAMN that thing needs a coat of paint BADLY! Nerf should make something similar as a modulus attachment.